Fitness and fun really can go hand in hand. Sometimes it just takes a little thinking outside the box, to mix up your workout and rediscover a love of movement. If you asked me 10 years ago if I’d consider exercise a priority, I would’ve laughed. Fast forward to now and I can honestly tell you it’s become an extremely important part of my life. Exercise hasn’t just helped improve my health and wellbeing, but it’s also given me people whom I now consider some of my dearest friends – and the mindset that exercise is actually fun. For some reason, there has become this misconception that exercise is something to dread. The lunges, the running, the sweating, and the trainer saying “30 more seconds!” a whole minute ago. The thought of it all can make you want to crawl back into bed or stay on the couch in front of a binge-worthy TV show. Fear not – working out doesn’t have to be a chore. The key is finding yourself a good crew and trying out new exercises that are fun and out of your normal routine. To mix things up, I once tried my hands at flying trapeze. The fear of heights made itself very present but the adrenaline that comes with facing this challenge was what excited me. Despite knowing that there is a giant net to catch you on your way down, just the slight idea of falling from such height definitely makes you think twice. Flying trapeze is a fun alternative to the gym, which I have to add, I’m also a strong advocate of. This is such a great way to bring a group of friends together and support each other in taking a leap of faith and achieving what can only be described as a strong sense of liberation. If flying through the air isn’t your cup of tea but you would still like to get your feet off the ground, aerial yoga might just be for you. Aerial yoga gives you the opportunity to carry out traditional yoga poses in a more acrobatic way – hanging mid-air from a hammock. Just like with yoga on the mat, this workout helps move and stretch the body, as well as improving balance and flexibility. I’m not going to lie, it was a little bit nerve-racking at first to put my trust in the hammock and flip myself upside down, but once you get the hang of it (pun absolutely intended) it gets addictive. This workout is the perfect mix of challenge, fun and calm. 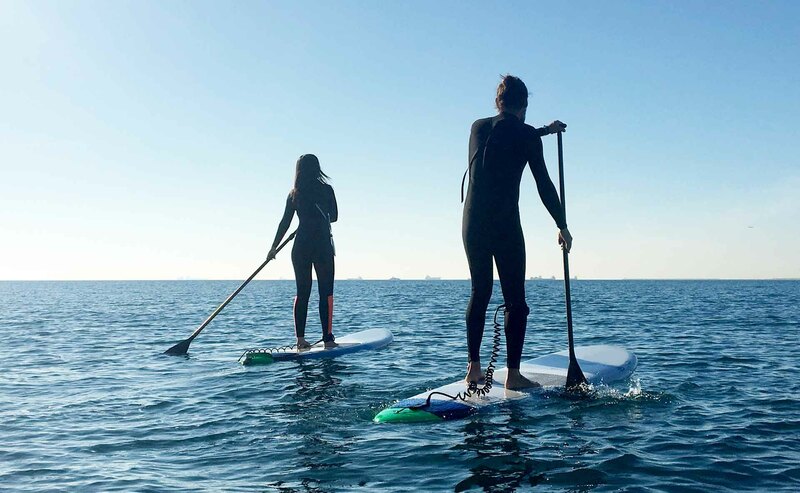 For all the summer lovers and water babies out there, you might want to try paddle boarding. This is a fantastic workout for the whole body as it requires putting the focus on core and lower body strength as well as balance. Alternatively, if you’d prefer to be on the water with a friend, try giving kayaking a go. It offers an amazing workout for your upper body and being with a mate makes it that much more fun. Gone are the days when working out meant just going for a run or lifting weights. Now, there are plenty of classes to choose from and most are offered at your local gym – Body Attack, Zumba, Pilates Reformer and Body Pump are a few really great classes that ensure you’re not alone in your journey. You’ll have the support and encouragement of the instructors and you're guaranteed to be surrounded by people of all different fitness levels. It is so important for both our physical and mental health to occasionally change our workout schedule. For me, mixing things up means I’m much more interested in putting on my activewear and heading out to work on my cardio and strengthen my muscles. It prevents me from viewing exercise as a chore or an inconvenience. Instead, I see it as giving my body what it needs through movement, what my mind needs through the focus and my heart what it needs through the friendships and the fun that come out of it all.